Type 1 Diabetes after 55 - Nick Melhuish: For decades, doctors encouraged patients to consume trans-fat laden oils and margarine. Why? For decades, doctors encouraged patients to consume trans-fat laden oils and margarine. Why? Don't believe me? Look at the facts. From the late 1970s, doctors persuaded many patients to give up the butter they had previously used on their sandwiches and for cooking, and instead use margarine and vegetable oils. As the BMJ records, there was never any good evidence that butter was contributing to cardiovascular disease. In fact, even in 1980, it was widely known that the French were consuming large amount of butter and full fat cheese, with relatively low levels of arterial disease compared to other Western countries. Many people currently in their 60s were conned into giving up butter and instead spent the next few decades using vegetable oils, margarines and processed foods, many of which were high in industrial trans fats. It is only very recently that trans fats have been largely eliminated from most Australians' diets, but the damage to coronary arteries from decades of medically sanctioned consumption of trans fats is extremely difficult to reverse. 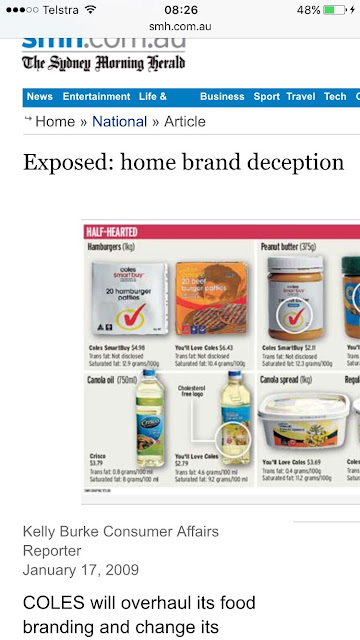 Even as recently as 2012, the Medical Journal of Australia (Editorial MJA 196 (1) 18 June 2012 ) reported many common foods such as, breakfast bars, chips, popcorn, savoury and sweet biscuits, and pastries contained unacceptable levels of trans fats, often without labelling. This particularly applied to the cheaper brands. Those health nutters who have always believed in consuming the same natural, minimally processed foods that their ancestors had eaten for centuries never fell for the margarine and hydrogenated vegetable oil trap. They didn't need to read all the scientific literature to tell them that doctors didn't have a clue. We stayed with butter and olive oil, ghee and coconut cream. And we certainly didn't eat bars for breakfast. Can you believe any Australian medical research?